Time management is a booming business—everyone wants to get more done and control time wasters. But for Christians the need to manage time is even more urgent. Time management experts and philosophers are fond of reminding us that our time is our life. Whatever controls our time, controls our life. We face different time challenges, but generally we have the same desire: To make the best use of our time to accomplish the things we feel are truly important. The thing that makes Christian time management different is the source of what we consider important. That source is God. So a good starting place is to consider how God looks at time and what He wants us to learn from time management. God inhabits eternity (Isaiah 57:15). Since He created time, the mind-boggling truth is that He was around forever before time even existed! To try to help us get a little of God’s perspective, the Bible says, “With the Lord one day is as a thousand years, and a thousand years as one day” (2 Peter 3:8). God is unrestricted by time. But though God is not controlled by time the way we humans are, He still puts great emphasis on it. He is always punctual—He always acts at the right time (even though to us humans it may seem like we have to wait a long time). He also has set aside certain times that He has blessed—for our benefit. These are designed to teach us important lessons and to reveal His plan to us. God tells us the Sabbath and His seven annual festivals are set apart and are His feasts (Exodus 20:8-11; Leviticus 23:2-4; for more about these meaningful holy times, download our free booklets The Sabbath: A Neglected Gift From God and From Holidays to Holy Days: God’s Plan for You). God created time as a tool. We were put in this universe of time to learn many lessons and to develop the character of God. 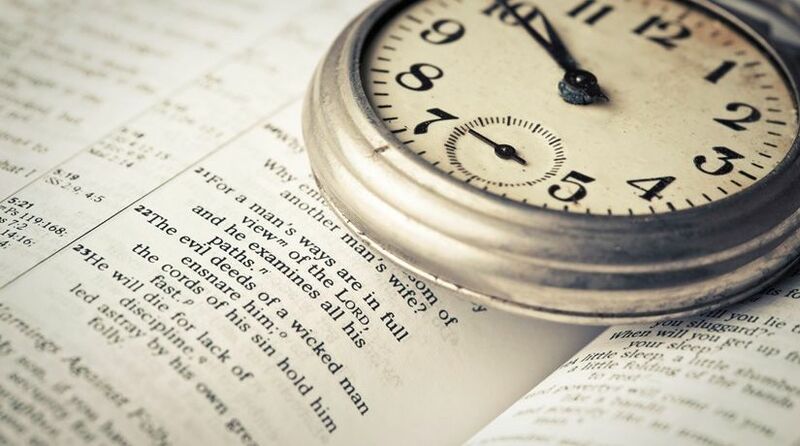 Christian time management means learning to use time as God wants us to use it. God wants us to become His children—to be like Him (Hebrews 2:10; 1 John 3:1-3)! To become more like God, we need to learn to have His priorities. We need to learn to use those priorities to produce a plan for improving our lives and aligning them to God’s plan. And we need to put those plans into action. God’s priorities and plans always produce results, and so can ours. God reveals to us what is truly most important in life. In the Sermon on the Mount Jesus said, “But seek first the kingdom of God and His righteousness, and all these things shall be added to you” (Matthew 6:33). The end of Matthew 6:33 reveals an amazing thing about God’s priorities. If we put what God says is important first, the other things we need and want will be added to us as well! But if we put money and things as equal to or higher priority than God’s Kingdom, in the long run we will have neither. We can’t take charge of our time without clearly defining our priorities. We must schedule what matters most first, or it will be pushed out by the hundreds of urgent and persistent things that come at us each week. “To master time management is to set priorities among your goals. There is never enough time to do everything, but there is always enough time to do what is important,” says leadership expert Lolly Daskal (“Master Time Management From Inside Out”). Our priorities become more real when we write them down as goals and rank them in order of importance. But goals can be just so much “someday I’ll” thinking unless we take the next step. We need a plan to get from “Someday Isle” to success. The Bible reveals a God who is a Planner. And He wants us to be planners too. We need long-range plans, annual plans and daily plans—and probably several plans in between. Let’s look at planning at its most immediate level. Based on God’s priorities, what does He want us to put into our schedule for each day? Plan time for God. This includes time for praying to God (study Psalm 55:17 and 1 Thessalonians 5:17 and our article “How to Pray”). He also wants us to study His Bible daily, as the Bereans did (see Acts 17:11 and our article “How to Study the Bible”). Plan time for family and friends. Relationships take a commitment of time together. For example, God commands parents to spend time teaching their children (Ephesians 6:4; Deuteronomy 6:7). Plan time for work. The Fourth Commandment tells us that work should take place during the first six days of the week so that we will be ready to obey the command to not work on the seventh day (Exodus 20:8-11). Plan time for health: eating a balanced diet and getting enough sleep and exercise. Plan time for learning. The Bible extols the importance of continued lifelong learning: “A wise man will hear and increase learning, and a man of understanding will attain wise counsel” (Proverbs 1:5). Plan time for rest and recreation. Jesus took His disciples away from the crowds at times to try to reduce the stress and be rejuvenated (Mark 6:31). The best priorities and plans in the world, though, are worthless if they aren’t put into practice. To implement our planned schedule requires constant motivation, focus and persistence. To choose the truly important, we must wisely act, not just react to the urgent things that come at us. God gives us a number of reminders and prods to help us see the urgency of practicing our priorities and plans. He tells us to count our days—to recognize how short life is and how precious every day is. That should lead us to make full use of our time. The apostle Paul encouraged us to “walk circumspectly, not as fools but as wise, redeeming the time, because the days are evil” (Ephesians 5:15-16). God wants us to recognize that every minute counts and should be used in a godly way. God is diligent, and He wants us to learn diligence (see “Diligence: Why Does God Prize It?”) and avoid laziness (Proverbs 12:24, 27; 13:4). Don’t just read this article, perhaps agree with parts of it, and then do nothing! Begin planning time in your schedule this week to examine your priorities and to begin to make a plan to align your time management with God’s priorities. A good place to start is to learn more about the most important priority. Read “Seek Ye First the Kingdom of God” today.